We blogged these guys back in february, and this week sees Californian songsters Softlightes hit London, playing two gigs. One tonight at The Spitz -109 COMMERCIAL ST. OLD SPITALFIELDS MARKET as part of the Modular Takes On Scruffy Bird Night. Three bands will be playing on the night Foals, The Softlightes and Bonde do Role. Doors are at 8pm sharp, with SoftLightes on at 8:30pm. It's their first ever UK show.... There is a £4 entry fee on the door. 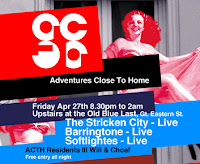 The Softlightes will also be playing live this Friday upstairs at the Old Blue Last as part of the Adventures Close To Home night. Doors 8.30 - 2am. Free entry all night.